City Limits Oranmore provides the ultimate in family entertainment as an emporium of indoor adventure for all ages. From the physically and mentally demanding challenges in their Zero Limits to their fully themed Jungle Drum Restaurant which can be hired for special occassions and can accommodate up to 140 people. A range of packages are available covering all of your needs from individuals to a family day out, corporate outings, birthday parties, fundraisers, summer camps, school tours or cinema packages. City Limits are well known for their excellent bowling facilities. Using Extreme Bowling technology to light up the lanes and the music cranked up, City Bowl is the ultimate bowling destination for you, your friends and familly. City Bowl sports eighteen bowling lanes, six of which are fully licenced with computerised scorekeeping capabilities for the competitive player and automated bumpers for beginners. Bring a group of friends and try it out for yourself. With Extreme Bowling, City Bowl can take your game to a whole new level with a feast of lights, music, wild bowling challenges and your favourite food and drink. Every year and all year round the City Limits also runs several bowling leagues and hosts a variety of tournamments. Each year they run a Singles, Doubles and Trios leagues, which are open to any keen bowler. The themed Jungle Drum Restaurant is part adventure, part restaurant and a complete entertainment experience for the whole family. The restaurant resembles a tropical rainforest with lush vegetation, waterfalls and indigenous creatures. The restaurant can be booked for parties or special occassions. As the weather improves you can dine on al fresco on their rooftop terrace which also can be booked for special events. 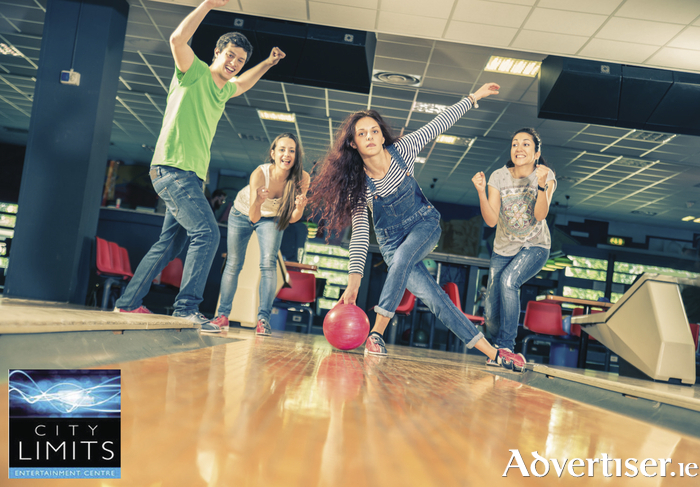 Click Here for a great bowling offer from City Limits. Galway to ask: How much of a Republic is Ireland?